Files with gb file extension can be found as ROM cartridges for emulators of the Nintendo Gameboy handheld gaming console. What is gb file? How to open gb files? The gb file extension is used for files that contain copies of Nintendo Gameboy video game cartridges. These so called ROM images, are used in emulators, that allow these games to be played on computers. Visual Boy Advance is emulator of Nintendo Gameboy Advance handheld gaming console. It emulates GBA, GBC, SGB, GBA roms. 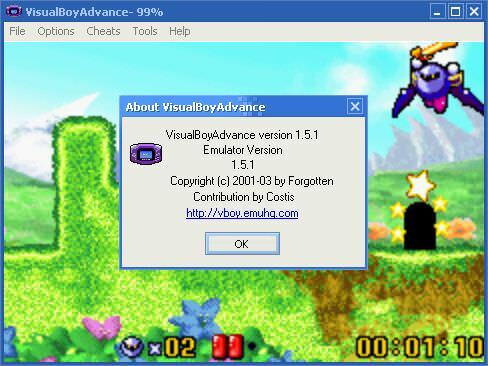 Various Ninendo Gameboy Emulators like Visual Boy Advance are able to work with the *.gb files. ROM images for various emulators are rarely just simply converted, usually they need to be created from the original source for certain emulator. and possible program actions that can be done with the file: like open gb file, edit gb file, convert gb file, view gb file, play gb file etc. (if exist software for corresponding action in File-Extensions.org's database). Programs supporting the exension gb on the main platforms Windows, Mac, Linux or mobile. Click on the link to get more information about listed programs for open gb file action.